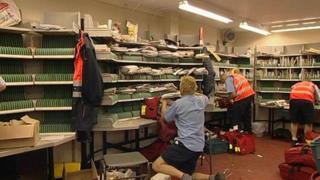 Postal workers have voted overwhelmingly to accept what their trade union called "a ground-breaking" pay deal. Previously the Communication Workers Union (CWU) had been threatening industrial action. The deal covers pensions and job security over the longer term, the kind of agreement more common in Germany. On pay, the workers will get a 9% above-inflation increase, phased across the next three years. The agreement will also bring an end to the union's threat of industrial action over Royal Mail privatisation last year. "We are extremely pleased to secure this ground-breaking deal with Royal Mail, which postal workers have overwhelmingly voted to accept," said Dave Ward, the CWU's deputy general secretary. Royal Mail said the agreement underlined the importance of its modernisation programme. "The agreement emphasises that efficiency is a prerequisite for growth," a spokesman said. "This is the first critical step to provide long-term stability and certainty for Royal Mail, our employees and our customers," said Moya Greene, the Royal Mail's chief executive. "Now the hard work starts," she added.